GRILL DIRECTIONS: Heat grill. In food processor bowl with metal blade or blender container, combine oil and vinegar. Add all remaining chimichurri sauce ingredients; process with on/off pulses until pureed. Spoon into small serving bowl. When ready to grill, place steaks on gas grill over medium heat or on charcoal grill 4 to 6 inches from medium coals. Cook 18 to 22 minutes or until of desired doneness, turning once. Meanwhile, place bell peppers skin side down on grill; cook 7 to 10 minutes or until tender, turning occasionally. Cut steaks into 8 pieces. Drizzle sauce over steaks. Serve bell peppers with steaks. 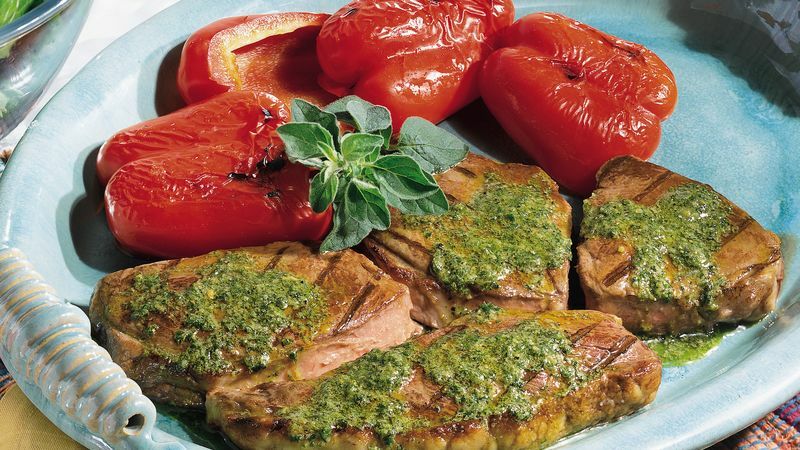 To broil steaks, place on broiler pan; broil 4 to 6 inches from heat, using times above as a guide, turning once. During last 7 to 10 minutes of cooking time, place bell peppers skin side up on broiler pan. Chimichurri is a thick herb sauce from Argentina. Made with olive oil, vinegar, parsley, oregano, onion and garlic, chimichurri is traditionally served with grilled food. Oregano is an herb popular in Mediterranean and Latin American cooking. A member of the mint family, oregano tastes similar to marjoram, but is not as sweet. Use your own favorite cut of beef in place of the sirloin steaks.